Everyone, even in the digital age, can find a use for useful tools online. This is why many business websites have started to offer useful tools as part of their website design. But why should you think about adding such features to your business blog? In this article, we will talk about just what adding tools for users can do for your linking, as well as for the traffic to your webpage. We will also explore some ideas for some useful tools that you can add to your webpage. One of the best reasons for adding useful tools to your webpage is because it can increase the number of visitors that you have come to your blog on a regular basis. If they find that there is a tool that they can easily use on a regular basis, chances are that users are more likely to look up your site again over others in the same field of business. You may also find that some people come to your webpage just to use these tools. But, later, they may just happen to think about your business first when they need something you can offer them. 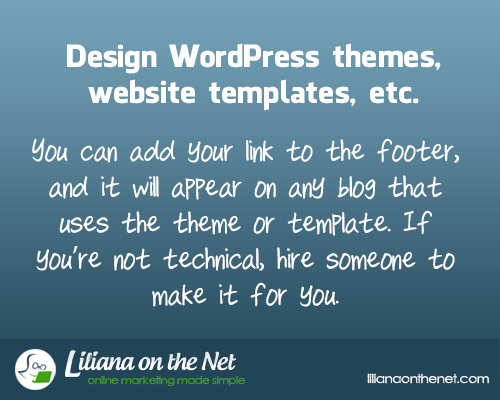 If you offer a variety of useful tools related to your business on your webpage, there may be bloggers, other webpages, and even other business sites that may gladly link to your page just so others can use the tools that you have posted on your page. Getting more links in a wide variety of places online can help you to get a lot more traffic to your site. Whether they are actually considering contacting you about your business or not, getting them to your webpage so that they can learn more is the first step in gaining new customers. 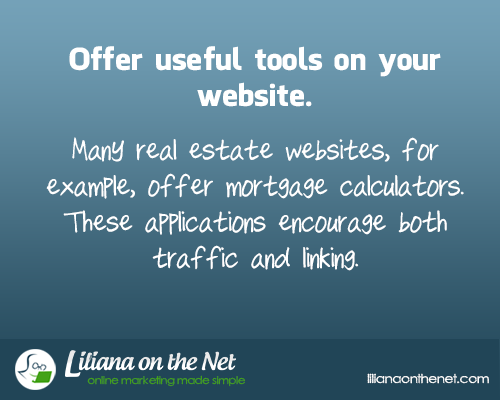 There are plenty of useful tools you can post on your webpages. For example, if you are a real estate webpage, you may want to post a mortgage calculator. A loan firm may want to post a total loan repayment calculator. Tax services can benefit from posting tax refund calculators. Even coffee shops can post things like quizzes to help you determine what type of their coffee you might like the most. Or, a car dealership can post a tool that can show potential customers what their lowest possible car payment for month could be. 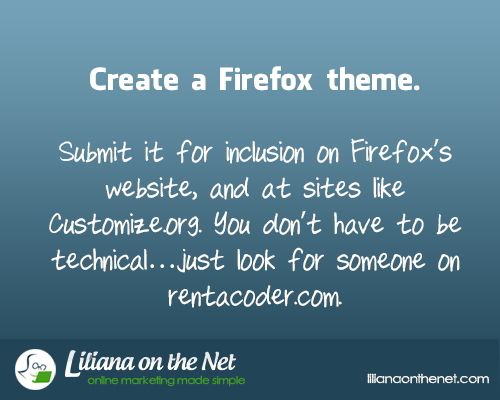 Creating a Firefox theme is quick, easy, and a great marketing tool for your business. Believe it or not, you can create a Firefox theme for free and submit it to their website. But why might you want to create a Firefox theme for your business? Here, we will give you just a few reasons. We will also let you know just how simple it is to create and submit a Firefox theme, even if you have very little experience in such matters. Want people to know more about what services you offer? You can design a Firefox theme that can always put them in mind about who to call in certain situations. Making your design visually appealing can also go a long way in helping people to understand that your business is slick, professional, and modern. In many ways, this sort of advertisement can work in the same way that, in the past, refrigerator magnets, calendars, and other free corporate giveaway items have worked. It puts you right at eye level when your customers need to remember you the most. Are you just getting started? Trying to break into the market? If so, a Firefox theme can be the perfect way to introduce you to a larger audience. Every day, lots of people visit sites like Firefox’s theme website, as well as websites like Customize.org. This means that not only can users download your theme, but they will also see your brand’s theme alongside themes sponsored by other big brands, solidifying your place in their mind among well-known and highly sought after brands from a variety of markets. If you are not already getting this sort of exposure for free, you are missing out. What if you think a Firefox theme is a great idea, but you do not have the experience to design and code one yourself? No problem! Just hire a professional from rentacoder.com to design and put together your Firefox theme. These coders are professionals who can create a modern, sleek looking theme that fits your wants and needs. With plenty of experience to go around, creating your Firefox theme will be a walk in the park for them. All you have to do is pay them for their work and time and you can have your own theme in no time. 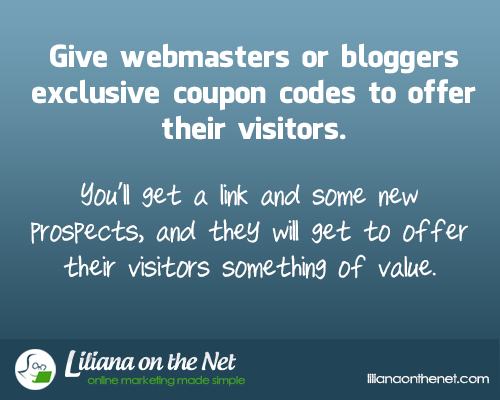 You’ll get a link and some new prospects and they will get to offer their visitors something of value. Other terms that are used to refer to the coupon codes are shopping codes, promotional or promotion codes, voucher codes, source codes, discount codes and promo codes. The idea about the coupons was openly used by the public back in the year 1902. This was the time when the American manufacturers and merchants started encouraging the consumers to purchase their products up for sale. To trace its history back, it had been the breakfast cereals which initially made use of the discount coupon codes. You now know how successful they were as most families, nowadays, eat the cereals for breakfast. Surveys prove that some eight billion dollars are generated in the transaction of giving away discount coupons in the United States alone. How much more if the total gross profit raised by these discount coupons would be computed for all the countries around the globe? All of us want bargains, it is human nature. Discount coupon codes are often given away for free by several companies. Both the online and physical stores give out these coupons which offer several opportunities for the consumers. Would you not be happy to receive discount coupons yourself? For sure you would be. Therefore if you approach a blogger to either offer to their readers the coupon as a discount to buy your product or for free, I am sure the blogger will be happy to even write a review for you and your product as you have given the readers a coupon. In addition you can offer discount/coupon codes to your own affiliates. Just imagine if you have a super affiliate who always promotes your services and brings many sales, what a bonus all round this would prove to be. Why not offer them a coupon code for their customers and you can even set up your system so the affiliate still receives the commission at the full price. This is the concept, that as long as we cover our costs, actually it is better to sell 1000 at £20 rather than 500 at £30. This will be an excellent way of thanking your own super affiliate. 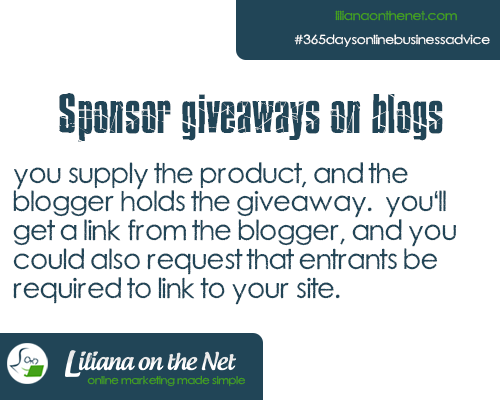 Have you thought about sponsoring giveaways on blogs? Many businesses might see giveaways as something that never really seems to get them what they want. However, there is a particular art to great giveaways. In this article, we will explore just how you can make giveaways work for you. We will also take a look at that ways giveaways can boost your business and brand in the future by getting your name out there. Giveaways just can’t be beat when it comes to blog marketing! You may want to think about bloggers you enjoy, blogs you follow, or industry blogs. Simply approach the bloggers by letting them know you would like to hold a giveaway in a contest style, and provide them with a prize of your product. Ask the blogger to be sure to link back to your company or business website. You can also ask the blogger to make it a stipulation that all the entrants in the contest also link to your site when they post their entries. The blogger can then choose the winner. All you have had to do is make the pitch, and provide the prize! Giveaways of this kind are fantastic because they can get those reading the blog, or thinking about entering your contest, to check out your website. If could also be possible that just casual readers of the blog could be interested about the people who want to partner with their favorite blog or blogger. In this way, you can get increased web traffic to your site. In the future, it may also mean that some of these same people could return to your site to purchase something that you offer online, or contact you when they need a particular service. Another way giveaways are great for business is that they put your products directly into customer hands. Customers do not have to take any chance when entering a contest, and, because of this, may be more likely to do so if they believe they could have a shot at a brand they would really like to try, or are curious about. You can give these away as prizes, or even give away smaller samples or inexpensive products to every entrant in the contest, then larger prizes to those who win the overall giveaway. Think that free samples of products are just weird gimmicks put on by grocery stores? Think again! Free samples can be given away online. There are many reasons why lots of stores and even online stores continue to give away free samples or inexpensive products. The results of these giveaways prove that they really work in a variety of ways. Why are free samples so successful when it comes to growing your business? Read on to learn more! Who doesn’t love free samples or giveaways? Everyone wants something for a bargain, and there is really no bigger bargain than getting something for free. 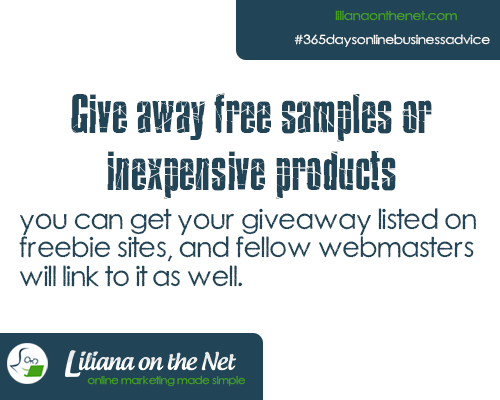 Freebie sites prove that lots of online users are out on the prowl to get their favorite products for free. When you give away free samples, you, too, can get listed on freebie sites. Not only that, but fellow webmasters may be more than happy to list your free samples or giveaways on their webpages just for the increased traffic it can get them, secondhand. Chances are, if you offer free samples, they will go over very big. For some larger businesses, warehouse space may be an issue. (including eBay and Amazon traders). Free samples can help you to reduce overall inventory, and gain you more space for free. Plus, the publicity that they can generate, as well as the web traffic, may be more than worth it. For many, this can be a win-win situation. Customers get what they want, and you automatically get more interest in your products, all while being able to move things in your warehouse so you have more space to store the things that you need to store, and possibly put on your webpages and online stores, later. How do free samples generate traffic? Simple: word of mouth. Whether online, or in person, people can fall in love with a product by getting a free sample, first and foremost. When more people come to your website to claim their samples or free products, they may also become interested in your brand, what other products you offer, and might even decide to buy something now, or at a later date. Asking others to link back to your site to let others know that you have free samples of your product may mean more people on your webpage.